The power management IC (PMIC) market is expected to witness a high growth during the forecast period. The market is estimated to grow from USD 20.09 Billion in 2015 to USD 34.86 Billion by 2022, at a CAGR of 8.08% from 2016 to 2022. The base year considered for the study is 2015 and the forecast period provided is between 2016 and 2022. The objective of the report is to provide a detailed analysis of the market based on product, application, and geography; information regarding the major factors influencing the growth of the market (drivers, restraints, opportunities, and industry-specific challenges); and detailed value chain and Porter’s five forces analysis. In addition, its objective is to strategically profile the key players and comprehensively analyze their market ranking and core competencies, along with detailing the competitive landscape for market player, and new product launches, acquisitions, expansions, partnerships, agreements, and contracts in the PMIC market. The research methodology used to estimate and forecast the size of the PMIC market begins with obtaining data on key vendor revenues through secondary research. Some of the secondary sources used in this research include information from various journals and databases such as IEEE journals, Factiva, Hoover’s, and OneSource. The vendor offerings have also been taken into consideration to determine the market segmentation. The bottom-up procedure has been employed to arrive at the overall market size of the PMIC market from the revenue of the key players in the market. This data triangulation and market breakdown procedures have been employed to complete the overall market engineering process and arrive at the exact statistics for all segments and subsegments. The analysis of the PMIC market includes extensive primary research to gather information and verify and validate the critical conclusions arrived at after an extensive secondary research. After arriving at the overall market size, the total market has been split into several segments and subsegments. The figure below shows the breakdown of the primaries conducted during the research study on the basis of company, designation, and region. The PMIC ecosystem comprises several key market players such as Texas Instruments Inc. (U.S.), ON Semiconductor Corp. (U.S.), Analog Devices, Inc. (U.S.), Dialog Semiconductor PLC (U.K.), Maxim Integrated Products, Inc. (U.S.), STMicroelectronics N.V. (Switzerland), and Linear Technology Corp. (U.S.) among others. These companies are either the manufacturer or the system integrators of PMICs and provide solutions to end-users, catering their unique requirements. The end users are from a wide range of applications, including consumer electronics, wearable electronics, healthcare, building control, automotive, and industrial & retail. 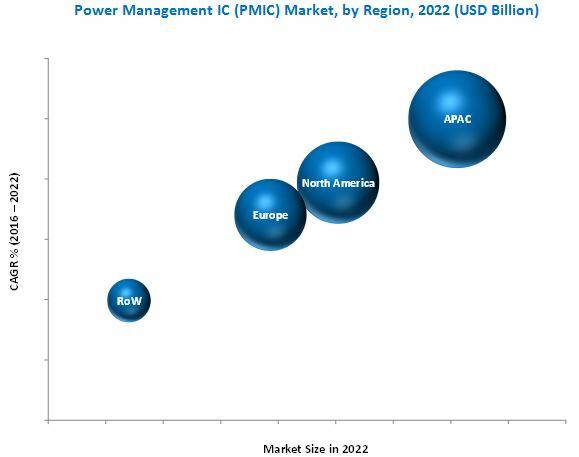 The power management IC (PMIC) market is expected to be valued at USD 34.86 Billion by 2022, at a CAGR of 8.08% between 2016 and 2022. Increasing demand for battery powered devices such as smartphones, wearable devices, tablets, digital cameras, navigation systems and others is acting as driver for the growth of the PMIC market. Moreover, technological advancement and growing trend of energy harvesting technologies are also driving the growth of this market. This report segments the PMIC market on the basis of mounting scheme, crystal cut, general circuitry, application, and geography. The market, on the basis of product, has been segmented into linear regulators, switching regulators, voltage references, and power management ASIC/ASSP/others. The PMIC market for power management ASIC/ASSP/others which includes battery charging & management ICs, energy management ICs, LED driver ICs, power-over-Ethernet (PoE) controllers, power factor correction (PFC) controllers, hot swap controllers, and wireless charging ICs, accounted for the largest share in 2015. ASIC/ASSP/others market is also expected to witness highest growth rate during the forecast period. This market growth can be attributed to the increasing demand for power management ASICs and ASSPs used in smartphones, tablets, laptops, and other portable devices. The growing demand for battery charging & management ICs used in portable devices and LED driver ICs for lighting applications is expected to ensure a healthy growth rate for this market during the forecast period. The market, on the basis of application, has been further segmented into automotive, wearable electronics, consumer electronics, healthcare, building control, and industry & retail. The consumer electronics application held the largest market share of the global PMIC market in 2015. The power management ICs are used in a variety of consumer electronic devices such as smartphones, tablets, wireless audio devices, laptops, portable navigation systems, and digital cameras among others. Besides their extensive usage, the PMICs allow manufacturers acquire low-cost devices while maintaining the performance of the overall systems. The PMICs are being replaced with the conventional use of voltage regulators in electronic devices such as laptops since they are available as a multi-chip-package. These factors are driving the growth of the PMIC market for the consumer electronics sector. The PMIC market for the wearable electronics application sector is expected to exhibit the highest growth rate during the forecast period, due to the increasing demand for power management in the smartphones and fitness & activity trackers. Apart this, the automotive is also expected to witness considerable growth rate during the forecast period, as PMICs are being used widely in infotainment, ADAS, telematics, and automotive passive safety applications. The healthcare, building control, and industry & retail application is expected to play a key role in changing the power management IC landscape; and the market for these sectors are expected to grow during the forecast period. The market, on the basis of geography, has been segmented into four major geographic regions— North America, Europe, APAC, and RoW. APAC accounted for the largest share of 36.1% of the power management IC market in 2015, followed by North America and Europe. The market in APAC is expected to grow at a CAGR of 9.98% during the forecast period. This growth can be attributed to the increasing demand for power management IC components from the consumer electronics and automotive sectors in this region. However, complex integration process for multi–power domain SOCs of PMICs is a major factor that is inhibiting the growth of the PMIC market. The multi-voltage SOCs require robust methodology and toolset for implementation and hence, a proper tool for analog and digital part is a crucial factor. Some of the major players in the PMIC market are Texas Instruments Inc. (U.S.), ON Semiconductor Corp. (U.S.), Analog Devices, Inc. (U.S.), Fairchild Semiconductor Corp. (U.S.), Dialog Semiconductor PLC (U.K.), Maxim Integrated Products, Inc. (U.S.), STMicroelectronics N.V. (Switzerland), NXP Semiconductors Netherlands B.V. (Netherlands), Linear Technology Corp. (U.S.), and Renesas Electronics Corp. (Japan). These players adopted various strategies such as new product developments, mergers & acquisitions, collaborations, and agreement to grow in the PMIC market. 11.8 Fairchild Semiconductor International, Inc.
11.11 Maxim Integrated Products, Inc.